Originally appeared in the November 1, 2012 edition of the Southside Times. Giving credit where credit is due, I owe my colleague, chef Jodi Traub, a nod of thanks for this week’s recipe. 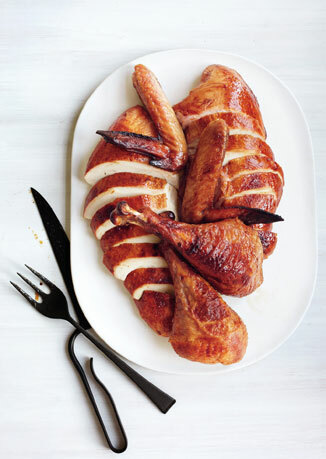 “I was looking for a new way to serve cornish game hens,” says Traub, who has a penchant for recipes with complicated flavor combinations. “Brining,” she points out, “is the key to making the birds so succulent.” But Traub also gives a nod to the original dish, explaining that she’d made some alterations to a recipe she’d discovered on a popular cooking website. And in keeping with this perpetual cycle of recipe tinkering, that’s what I’ve done here: replacing the game hens with chicken thighs and making my own minor variations. Chicken thighs are woefully economic and, when properly prepared, succulent and flavorful. I’ve also employed a bit of stock to add some cooking liquid to the braising mixture. Traub often serves rice pilaf and steamed green beans as accompaniments for this dish, but I encourage you to devise your own favorite combination. In fact, that’s what this is all about, right?—taking these recipes and coming up with your own gastronomic permutations and alterations. So don’t be shy: join the culinary conversation. 1. In a large pot, warm water and dissolve sea salt for brine. Allow mixture to cool completely before pouring over thighs in a container large enough to cover thighs. Soak in brine for at least 2 hours. Afterwards, remove from solution and pat dry. 2. Preheat oven to 400° F. Heat olive oil in a high-side sauté pan; season skin-side of thighs with kosher salt and cracked black pepper, and pan-sear thighs (skin-side down) until exterior is golden brown and crispy. Remove chicken from pan and reserve on plate. 3. Add onions and cook until translucent and tender; add garlic and sweat briefly. Add a bit of oil along with flour, stir to form a paste (called a roux). Add in balsamic and water; stir in apricot preserves. Return thighs (along with rendered juices) to pan and cover; place in oven for fifteen to twenty minutes, or until thighs juices are running clear. 4. Remove braised thighs and keep warm. Strain braising liquid through a colander or chinois and keep warm. If you like, add a bit of chopped apricot to this sauce. 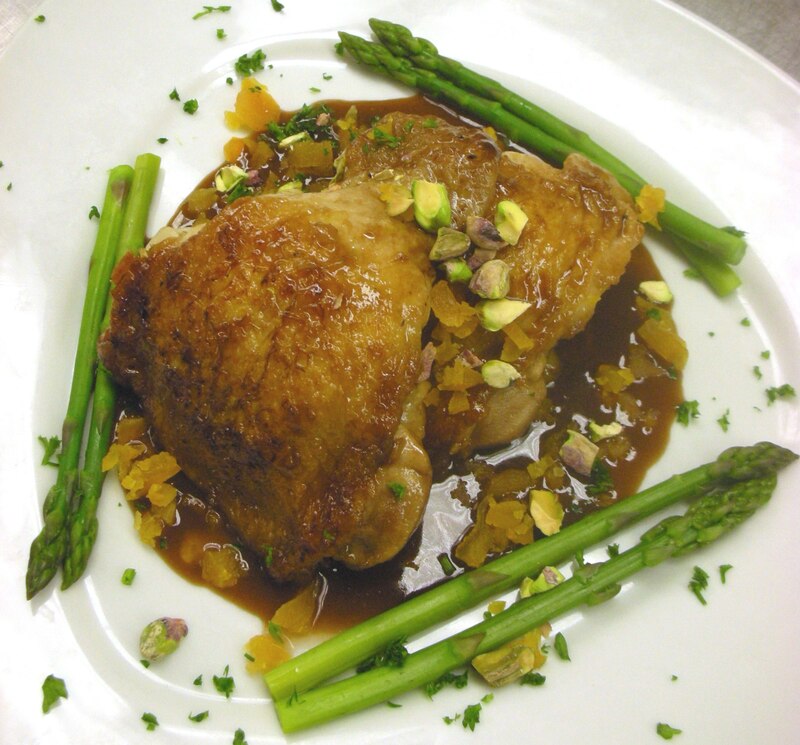 Serve thighs with sauce, and garnish with chopped apricot, parsley, and pistachios. Originally appeared in the September 6, 2012 edition of the Southside Times. You might have to do some investigating at your local market, but ground lamb is indeed available. 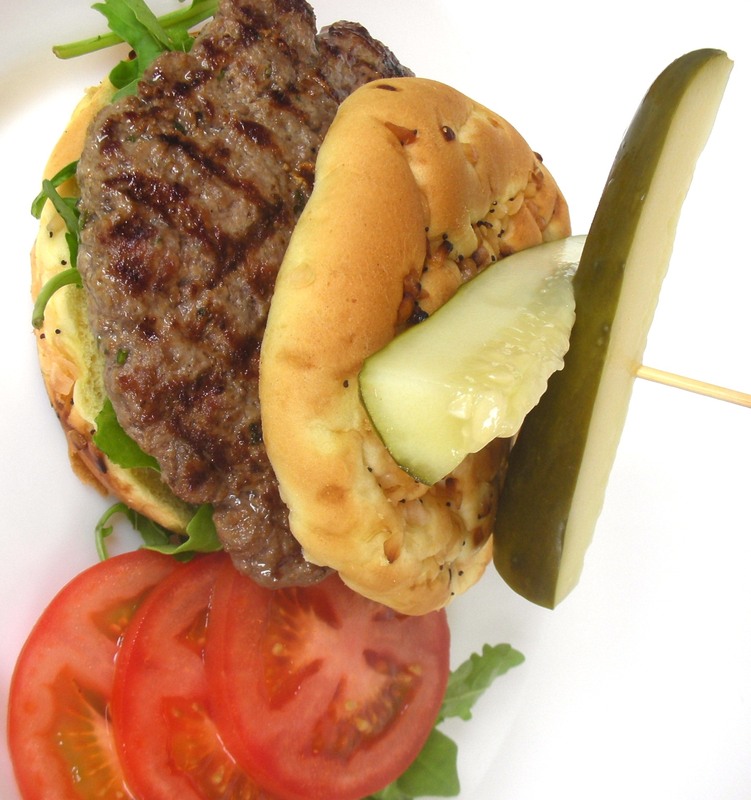 And while I didn’t include any cheese with this particular recipe, you could certainly do worse than add a bit of feta to the top of this lamburger. Now, let’s talk about the “quickles.” These are quick pickles, meaning that you can have them finished and cooled overnight, but they must remain refrigerated throughout their brined lifetime. And owing to the subjectivity involved with the size of the cucumbers and desired application, I’ve kept the execution (read size of the pickling jars, the amount of garlic and arbol) rather loose. And as this is a sort of basic “quick” brine, this is a really fun way to transform existing produce into a salty treat, and a wonderful way to get the kids involved in creating a personalized product. Serve your lamburgers and quickles and some sort of crunchy side—fries, kettle chips, it’s your call. And as I’ve indicated in the picture, fresh arugula—because of its peppery profile—is an appropriate accompaniment to your savory sandwich. And though I invoke one of my former chefs who used to say, “You can never cook lamb too rare,” I encourage my readers to simply be judicious and create something delicious. 1. In a large stock pot, combine water, sea salt, and cider vinegar; bring to a gentle simmer for about 5 minutes. Remove from heat. Bring a separate stockpot of water to a gentle boil (this will be for sealing jars, so make sure you account for the height and amount of water that will be displaced). In prepared pickling jars, arrange cucumber spears with a judicious mixture of fresh dill, garlic, and arbol chiles. Carefully fill each jar with brine mixture to the rim. When jars are sealed tightly, place in boiling water and allow tops to pop, this will indicate the lid-and-band seal is tight. Remove jars from water and allow to cool before placing in the refrigerator for 24 hours. Originally appeared in the June 28, 2012 edition of the Southside Times. The prime imperatives behind this week’s dish: keep it light, keep it cool. And it doesn’t hurt to keep things simple, while you’re at it. This recipe succeeds on all three levels. The salmon should rest with the sweet-and-savory marinade long enough for the tender fish to absorb the Asian-inspired concoction. There’s a bit of spice here—what with the wasabi, crushed red pepper, and ginger—but it’s a nice counterbalance to the cool-crisp characteristics of the bok choy slaw. Like most vinegar-based slaws, you don’t want to make this too far ahead of time before actual service, as the weight and absorption of the dressing compromises the volume and texture of the vegetables. In other words: you can make your dressing in advance, but please wait until the last minute to execute this step. As for as cooking procedure, I would suggest firing up the grill outside, but due to the Mohave Desert-like state of most of our arid lawns, it’d probably best to hang out within the ambient coolness of air conditioning. Best bet: a sturdy grill pan. After assembling and serving this dish at the kitchen table, my wife, Jess, called this one of her favorites. Guess what I plan on cooking tonight? 1. In a large bowl, thoroughly whisk all ingredients from wasabi through vegetable oil, and pour into a plastic, zip-tight freezer bag. Add salmon and marinate for at least four hours. Afterwards, place a grill pan to medium-high heat, and brush with vegetable oil or spray with cooking spray; preheat oven to 400° F. Remove salmon from marinade (but don’t throw away), and gently place on grill. Sear and create grillmarks before flipping to opposite side; place salmon on oven-safe dish and finish cooking until desired doneness is reached, intermittently brushing reserved marinade over salmon. Remove from oven and allow to rest. 2. In a separate bowl, thoroughly whisk oil along with following six ingredients (dressing can be made ahead of time). Toss bok choy, pear, and radish in a bowl, and drizzle on dressing; gently toss to coat. 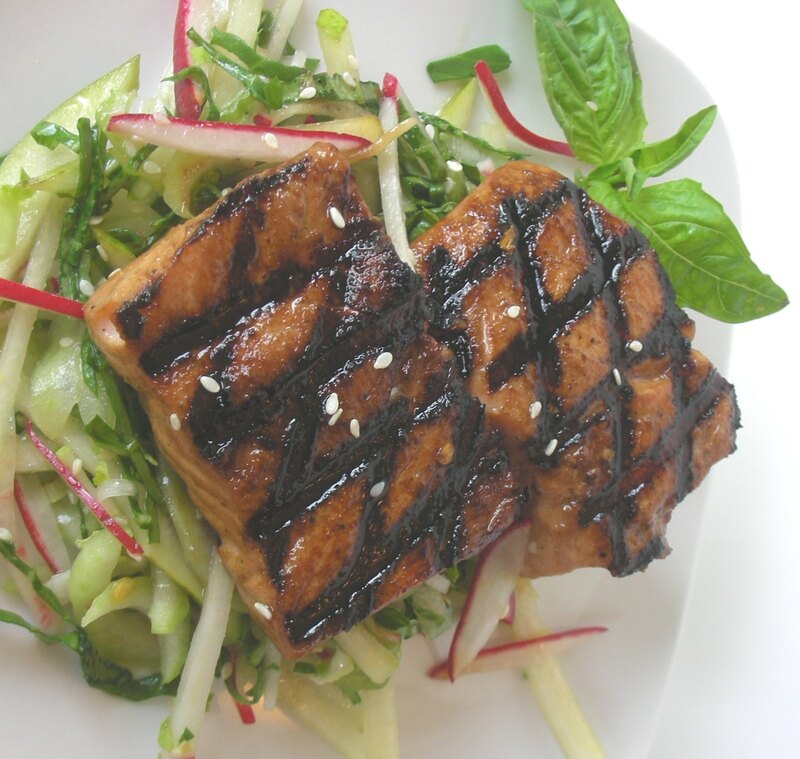 Serve salmon on top of bok choy slaw.